Today’s blog post was written by our dietetic intern, Hallie Nix. Thanks, Hallie! Summer is here, and I could not be more excited! I love getting to sit out on the patio with a cold Topo Chico and enjoy a summer-y meal! Ever since starting my journey as a nutrition student (and now as a dietetic intern), one of my favorite things to do is re-vamping my favorite meals to increase the nutrient content. 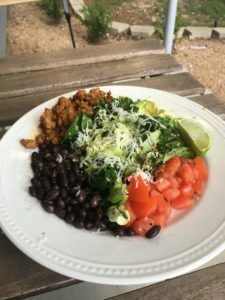 One of my all time favorite meals is taco salad… or any Tex-Mex style meal if I’m being honest! This version was so easy and delicious, and with a few tweaks to the classic recipe, I was able to really boost the fiber & veggie content and add a whole lotta flavor! I don’t know about you but talking about food is making me hungry, so let’s get right to it – below is the recipe, then I have some comments on the reasons why I like it! Brown the turkey and season according to seasoning package directions. To prepare the salad dressing, mix all the ingredients in a food processor. Pour over the mixed spring mix, kale, spinach and quinoa (you can use whatever greens you have…this is just what I had at home!). Prepare avocado, tomato, black beans (I prefer to rinse the beans off before serving). Arrange it beautifully on a plate J, drizzle the salad dressing, top with grated cheese, cilantro and lime! Easy, right?! So here’s why I like this recipe so much: First off, I am a HUGE fan of fast, easy and familiar recipes. While I like cooking, often times life is crazy, so I become a creature of habit in the kitchen and go to what is familiar. 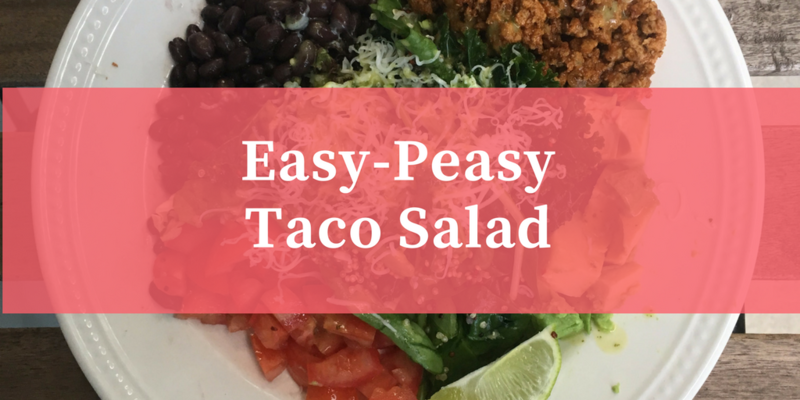 I grew up eating taco salad regularly (at least once per week) and so naturally this is a go-to recipe for me. Secondly, I like this because of the fact that I did not have to compromise taste in revamping this recipe (always a win for this nutrition student!). Usually, taco salad is served as ground beef with chips, cheese, sour cream and some shredded lettuce and tomato. 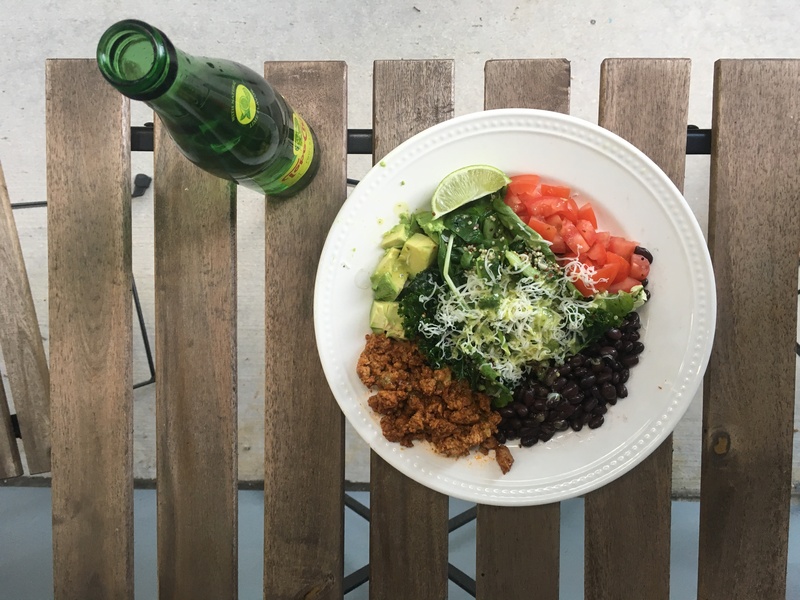 As a (soon to be) dietitian, I am always looking for ways to pack some extra nutrients into a meal, and the small changes I made to this recipe does just that! Ground turkey is an excellent substitution for ground beef, providing an excellent source of protein without as much saturated fat or cholesterol. I also love the addition of quinoa – it added a great texture and it is an excellent source of fiber without all the salt and fat tortilla chips have! Swapping sour cream with avocado added the creaminess you’d get from sour cream, all the while exchanging the saturated fat from sour cream to monounsaturated fat. The dark leafy greens, tomatoes, and beans are packed with vitamins and minerals that our body needs. The dressing added a whole lot of flavor, without adding a lot of salt or fat! Overall this was so easy to make, quick, delicious and nutrient dense– 10/10 in my book! This meal is also a great example of how arranging a plate can be a lot more than just for looks (although it does look pretty if I must say so myself 🙂 ). I started by putting the salad on first to make sure that I filled at least half of my plate with vegetables. I then arranged all of the toppings around the salad. I have found that using this simple strategy has really helped boost my veggie consumption and made vegetables not just an afterthought, but an essential part to the meal.